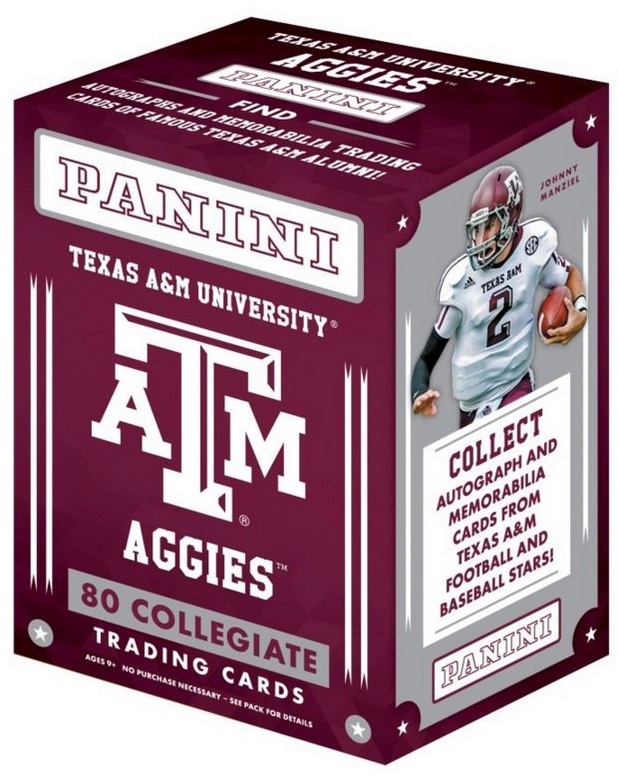 The Aggies are on full display in 2015 Panini Texas A&M Collegiate. Covering multiple sports for the new SEC school, each box promises one autograph or memorabilia card. Checking in at 50 cards, the base set includes former football, baseball and basketball stars. Top gridiron options include Mike Evans, Johnny Manziel, Ryan Tannehill, Martellus Bennett and Jake Matthews. Baseball is represented by Michael Wacha and Cliff Pennington, and DeAndre Jordan is the key basketball name. The biggest draw for collectors, Signatures and Memorabilia cards are available for select football and baseball players. There is also a focus on former Heisman winners and All-Americans with Honors inserts. Several parallels, including Silver, Gold and Black, are available for the base and insert cards. The product is available in two different formats, with retail boxes promising two hits and blasters yielding one autograph or relic per box. This multi-sport card product for the Aggies is one of several Panini Collegiate options. View the full lineup in our detailed 2015 Panini college hub. TEXAS A&M Football 100 Card Lot 1972 to 2015 AUTO Jersey RC # OVER 60 AGGIES !! TEXAS A&M Football 100 Card Lot 1972 to 2015 AUTO Jersey RC # OVER 50 AGGIES !! 2015 Upper Deck Goodwin Champions Mike Evans Auto inscribed "Go Aggies" #8 10!!! Any soccer in these Collegiate collections? Alan Jenkins � It’s possible, but there has been no mention of it in anything I have seen. Plus, SEC schools don’t have D1 men’s soccer. Thanks Trey, I’ll keep watching just in case.